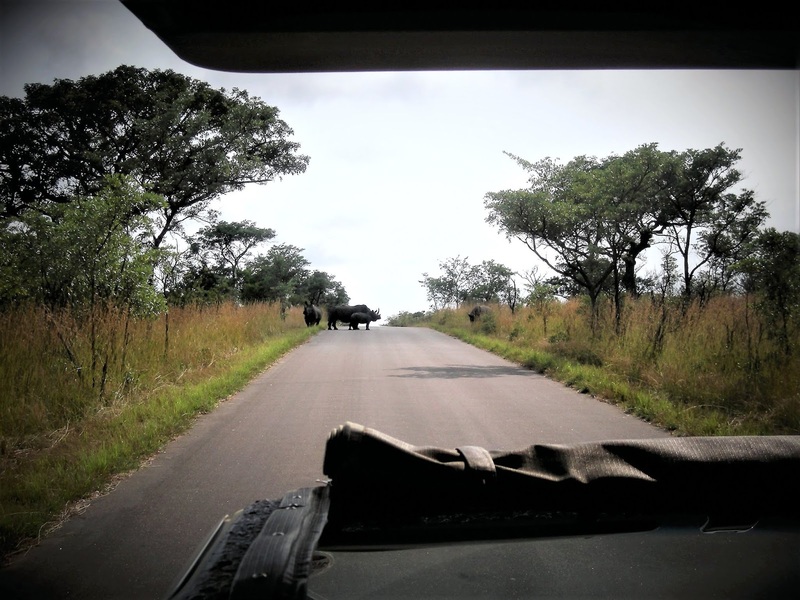 Easter 2019: Kruger National Park to enforce daily gate quotas! South African National Parks (SANParks) is urging visitors to be aware of gate quotas for day visitors at the entrance gates to Kruger National Park that will be in effect over the coming Easter long weekend. Through the day visitor quota for Kruger National Park SANParks aims to better manage the expected volumes of visitors, as well as to improve the visitors' expectations. SANParks has introduced three time slots, of which day visitos can choose from. It is advised to book a time slot prior to arrival, as pre-booked day visitors will get preference over non-booked day visitors at Kruger National Park's entrance gates. Day Visitor pre- bookings are subject to a non-refundable booking fee of R43 per adult and R22 per child. Due to existing contractual arrangements with Open Safari Vehicles (OSVs), they have paid for the annual operating permit and are authorised to enter external gates 15 minutes before opening time to ensure fair distribution/flow of traffic. Tanzania is set to ban the production, importation, sale and use of all single-use plastic bags by July 2019. Single-use non-biodegradable plastics have been identified by the United Nations as one of the world’s biggest environmental challenges. Tanzania will join its East African neighbours Rwanda and Kenya, which have already banned single-use plastic bags. Zanzibar, a semi-autonomous region of Tanzania, implemented a ban of light plastics already back in 2006. Namibia has also banned plastic bags, but only in its game parks and nature reserves! update (18 April 2019): Comair just announced that due to a Labour Court temporary interdict the striking NUMSA ground staff are required to return to work. update (18 April 2019): Comair is pro-actively calling as many customers as possible 72 hours before departure to facilitate check in and is providing additional bag-drop counters. Customers are advised to check-in online or use the airport kiosks and to drop bags at the dedicated fast-bag-drop counters. The National Union of Metalworkers of South Africa (NUMSA) has issued Comair, which operates British Airways' domestic routes in South Africa and also operates as a low-cost carrier under its own kulula.com brand, with a strike notice. This allows those airport ground staff represented by NUMSA to strike from 13:00 on 18 April 2019. Just over 700 of Comair's 2 200 airport ground staff are NUMSA members. NUMSA represents just over 50% of Comair's 700 airport ground staff. The airline has a staff complement of 2200 people. According to Comair, the airline has a comprehensive contingency plan in place and intends to continue its daily operations. However, in order to ensure a continuous operation for its customers over the busy Easter period it has approached the Labour Court for an urgent interdict to prevent the strike. NUMSA's strike notice follows the Commission for Conciliation, Mediation and Arbitration (CCMA) issuing a certificate of non-resolution on 26 March 2019, after the parties were unable to reach an agreement about a salary discrepancy dispute. Cathay Pacific to reintroduce its seasonal service between Hong Kong <> Cape Town! The flag carrier of Hong Kong, Cathay Pacific, is set to reintroduce its seasonal nonstop service between Hong Kong International Airport (HKG) in Hong Kong and Cape Town International Airport (CPT) in Cape Town. The three-times-weekly service, from November 2019 to February 2020, will complement Cathay Pacific's existing daily non-stop return flights to OR Tambo International Airport (JNB) in Johannesburg and will be operated by state-of-the-art Airbus A350-900 aircraft. Cathay Pacific will operate its return flights to Cape Town on Mondays, Wednesdays and Fridays. Kenya Airways to increase flights between Nairobi <> New York! Kenya's flag carrier, Kenya Airways, is set to increase the number of nonstop flights between Jomo Kenyatta International Airport (NBO) in Nairobi and John F. Kennedy International Airport (JFK) in New York. From June 2019, the airline will operate seven weekly return flights instead of the current five weekly return flights to New York. In January 2019, Kenya Airways reduced the number of flights between the two destinations due to low demand from the seven to five a week. United Airlines plans to launch a nonstop service between New York <> Cape Town! Major American airline United Airlines has applied with the U.S. Department of Transportation for authority to launch a nonstop seasonal service between Newark Liberty International Airport (EWR), which serves the New York City - Philadelphia Urban Area, and Cape Town International Airport (CPT) in Cape Town. Effective 15 December 2019, the airline is planning to operate three weekly return flights to Cape Town on board a Boeing 787-9 Dreamliner aircraft featuring 48 seats in business class, 88 seats in economy plus and 116 seats in economy. The nonstop service, which will be the only nonstop service between the United States and Cape Town, will decrease the current travel time from New York City to the Mother City by more than four hours and provide customers from more than 80 U.S. cities with easy one-stop access to Cape Town. 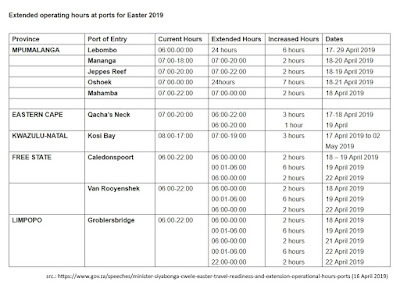 Easter 2019: Operating hours extended at some of South Africa's ports of entry! 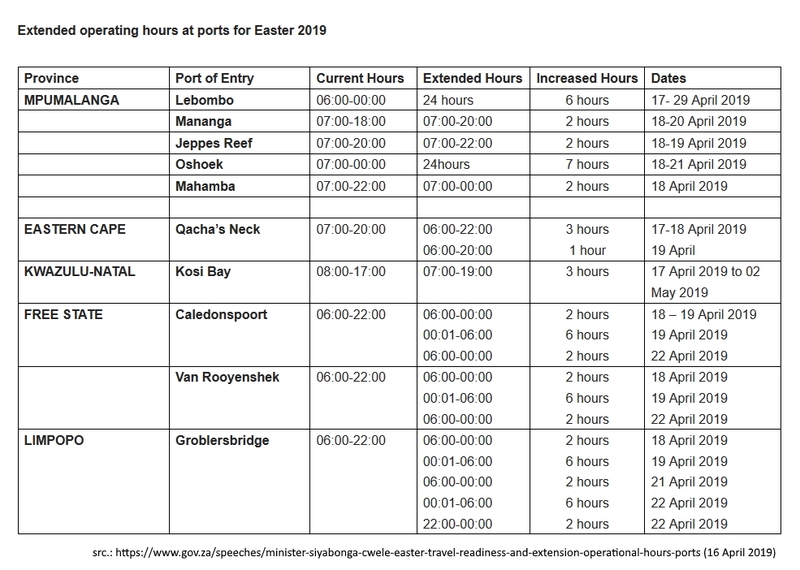 South Africa's Department of Home Affairs (DHA) has announced that it will extend the operating hours at some of the country's border posts during the Easter 2019 holidays. In addition, the DHA will install temporary infrastructure to help with the faster processing of travellers and will increase capacity of staff deployed at the South Africa's ports of entry. An additional 237 staff members will be deployed at selected ports.